My Block's in Quiltmaker's 100 Blocks!! 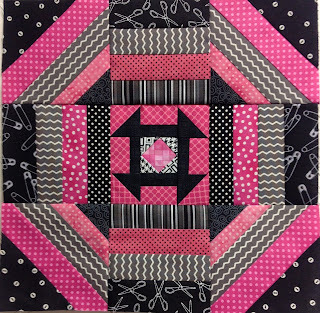 I am sew thrilled to finally be able to share a truly fun block that I made back in February for the just released Quiltmaker's 100 Blocks magazine issue #12. A big welcome to my new visitors who are stopping by from Quiltmakers Blog Tour. I hope you'll enjoy seeing my block and learning a bit about me: Sandra Starley, AQS Certified Quilt Appraiser, antique quilt collector and lecturer, quilt designer, etc. and leaving a comment to be part of the GIVE-AWAY to win a your own copy of the magazine with photos and patterns for all 100 blocks (more about that later). . .
Drumroll: Here is my Echoing Churn Dash!!!! I love using black and white and hot pink and polka dots. I also had fun with the sewing themed fabric used in the outer edges of the block (buttons, pins, and scissors). It was interesting to play with the traditional design and create an "echoing" pattern. As a quilt appraiser, I spend a lot of time studying quilt history and collecting antique quilts. I love to share my collection in quilt history trunk shows, quilt study classes and more. If you are looking for an entertaining and informative speaker/teacher for your quilt show, retreat, etc. please feel free to contact. I have an extensive antique quilt collection and would love to share them with you. I also really enjoy giving old quilts "New Life" by remaking antique quilts both as close reproductions and modern makeovers. Echoing Churn Dash is one of my modernized blocks. 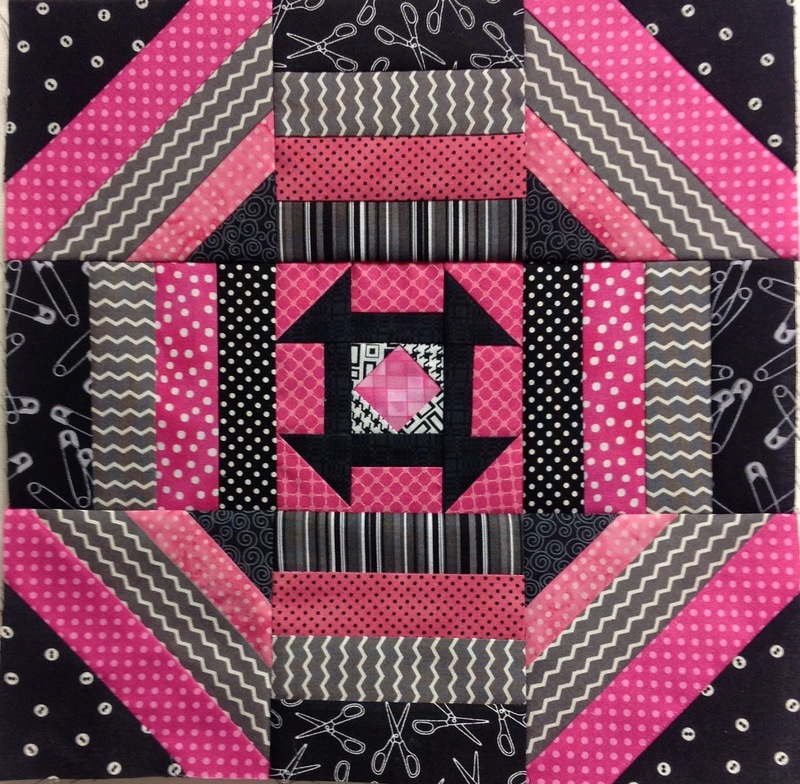 I was inspired by this funky churn dash/monkey wrench quilt in my collection. This quilt maker clearly sewed to the beat of her own machine. Monkey Business, antique monkey wrench, c. 1880. Here is another inspiring antique quilt - Amish Churn Dash- circa 1920 that would be right at home at any modern quilt show. Comment #4 Janet O. and #115 Barefoot Thunder will be getting a copy of Quiltmakers 100 blocks. Thank you for all the great comments!!! 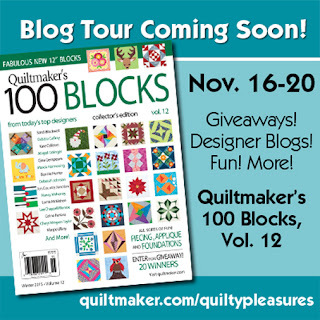 2 GIVE AWAYS-- Quiltmaker is generously sponsoring a giveaway, please leave 1 comment for a chance to win your own copy of Quiltmaker's 100 Blocks Issue #12. Since I love working with antique blocks, share your favorite traditional block in your comment. And to make things twice as fun, I will also be giving away a copy of QM Issue #12 to a lucky commentor. Be sure you leave your email, if you are a no reply or anonymous blogger, so you don't miss out. Leave just 1 comment and on November 23rd at 3 p.m. Eastern, I will pick 2 winners. After commenting, be sure to click on the photo below to visit QM to see more blocks and join in more giveaways.